New Delhi [India], Oct. 27 (ANI): Days after a Swiss couple was brutally attacked in Fatehpur Sikri, the Ministry of External Affairs (MEA) on Friday said they were in touch with the Swiss embassy and are quick to redress the issue. New Delhi [India] Oct 17 (ANI): External Affairs Minister Sushma Swaraj on Monday night said that 10 Indian crew members were still missing from the Emerald Star capsize incident. New Delhi [India], October 13 (ANI): 15 Indians were rescued after a cargo ship sank in the Pacific Ocean off the Japan coast on Friday, confirmed the External Affairs Ministry (EAM). New Delhi [India], October 6 (ANI): The Ministry of External Affairs on Friday confirmed that there were no new developments at the face-off site in the Doklam plateau, since the August 28 disengagement. New Delhi [India], Sept 30 (ANI): India has said that it has no plans to mediate between Myanmar and Bangladesh to solve the Rohingya refugee crisis. New York [USA], Sep 21 (ANI): Ministry of External Affairs (MEA) spokesperson Raveesh Kumar on Wednesday said that Sushma Swaraj discussed peace and reconciliation process with Afghanistan. New York [United States], Sept 21 (ANI): India's External Affairs Minister (EAM) Sushma Swaraj held bilateral talks with Afghan President Mohammad Ashraf Ghani in New York on Wednesday. 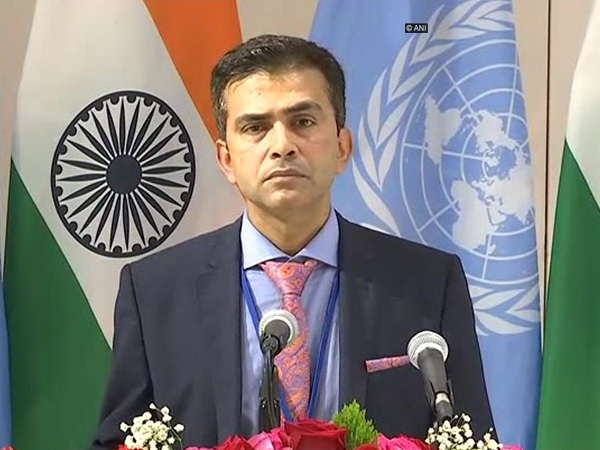 New York [U.S.A.], September 20 (ANI): India has reiterated its commitment to the cause of Palestine and has expressed solidarity with its people. New York [U.S.A.], September 19 (ANI): The Ministry of External Affairs (MEA) on Tuesday said that the issues of maritime security, connectivity and proliferation were discussed at trilateral meeting between India, Japan and the United States. New Delhi [India], July 21 (ANI): Consul General of India in Frankfurt (Germany) Raveesh Kumar will replace Gopal Baglay as Ministry of External Affairs (MEA) spokesperson.